ITEM: Valerie D'Orazio turns 36 today. Happy birthday, Val! 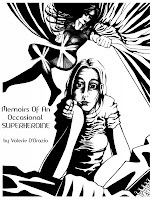 Also worth noting is that she recently posted Memoirs of an Occasional Superheroine -- with a much cooler and more appropriate cover -- online for free. You can read it here. ITEM: Yours truly got the chance to develop a new site design for the Comic Book Bin website. Hervé St-Louis announced it a little over a week ago, but we've both been too busy to catch up with each other until this morning! It's one of the better/more efficient site designs I've been able to work on in a few years, so I had fun working on it. They're still working on getting someone in to work on development full-time, so the new design probably won't go in place, I'm guessing, until late spring/early summer.